If you know us, you’ll be aware that we have a thing for ethical business. 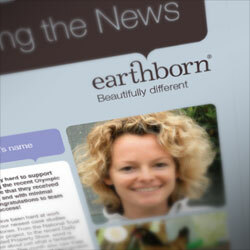 Earthborn Paints are an environmentally friendly paint company, so when their comms agency, Teacake Tuesday, were looking for someone to help Earthborn Paints with their email marketing, we were more than happy to help. It’s widely understood that it’s easier to keep hold of customers than it is to find new ones and that’s why email is such a popular way to stay in touch with them. Of course, there’s a lot of great resources out there for creating stylish emails including two of our favourites, MailChimp & Campaign Monitor, but the templates they provide aren’t always on-brand or individual enough. Our custom templates let Earthborn Paints manage their own email marketing and customer relationships in a more cost effective way and with a style all their own. We also created tools to help with the workflow, to make sure all the content is the right size, shape & format.